DYNAMICS AMONG NATIONS employs insights from the study of complex systems to examine the interdependent, networked environment of today’s global power transitions – as well as the rise and fall of empires in Europe and Asia. For too long, policymakers and economists have tackled problems of institution building, governance, and economic policy reform by asking, “What is the best solution” or “What should we address first”? When the problems they face are complex – not just complicated – these are the wrong questions. Complex problems arise from complex systems made up of networks of interacting agents – families, ruling coalitions, governmental bureaucracies, markets, unions – that influence each other within the larger system. The behavior of one agent affects the behavior of another, and the resulting dynamics produce novel and powerful self-organizing behaviors in other agents sharing the system, and create a spiral of feedback loops and linked responses. When does a component recognize that it is a contributing agent? Do the parts know they are a wave? The study of complexity helps us recognize the significance of individual change in terms of the larger pattern or system of which it is a part. We must learn to view the entire landscape of interacting units as a complex system – and learn to identify feedbacks and interdependencies that affect different actions. Only then can we build a strategy that is sufficiently dynamic and adaptive to attain desired outcomes in a constantly changing environment. The Wilson Center Science and Technology Innovation Program presented “Dynamics Among Nations: A Conversation with Hilton Root” on February 25, 2015. 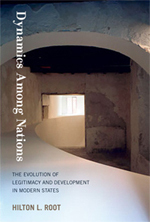 Dynamics Among Nations: The Evolution of Legitimacy and Development in Modern States Root, Hilton L. Reviewed by Armando Geller, JASS, Vol. 18, Issue 4, October 2015. Dynamics Among Nations: The Evolution of Legitimacy and Development in Modern States Root, Hilton L. Reviewed by Vikas Kumar, Journal of Economic Issues, Vol. XLIX No. 4 December 2015.